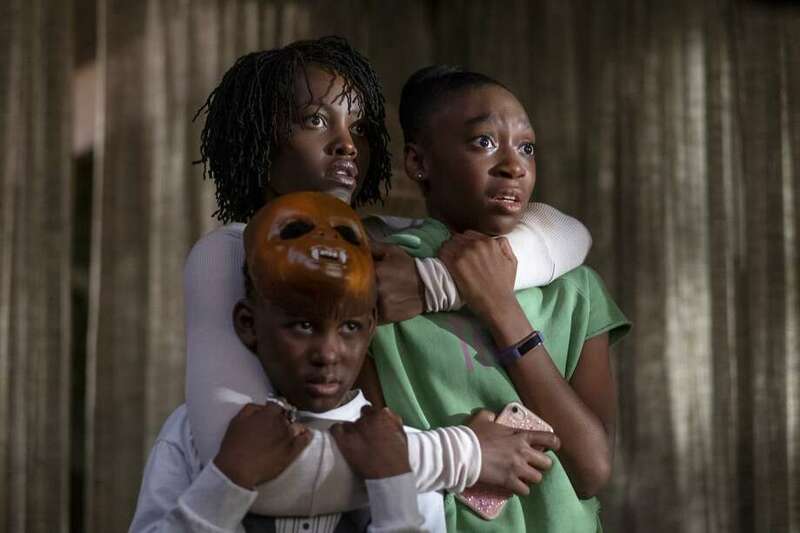 From left, Evan Alex, Lupita Nyong'o and Shahadi Wright Joseph in a scene from "Us," written, produced and directed by Jordan Peele. When you’re hot, you’re hot. Following his debut success with “Get Out” (2017), Jordan Peele’s new horror thriller has already grossed $70 million, tripling its $20 million budget. In 1986 at California’s Santa Cruz beachside amusement park, young Adelaide (Madison Curry), clutching a candied apple, has a terrifying experience after wandering into an eerie “funhouse of mirrors.” It’s so traumatic that she’s never discussed it with anyone. Cut to the present, when vacationing Adelaide (Lupita Nyong’o), her husband Gabe Wilson (Winston Duke), teenage daughter Zora (Shahadi Wright Joseph) and young son Jason (Evan Alex) wind up at the same beachside amusement park. Back home that night, a menacing family of four, clad in red jumpsuits and carrying huge scissors, suddenly appear in their driveway, trapping the Wilsons inside. It turns out they’re the Wilsons’ zombie-like, tethered doppelgangers. Adelaide’s covetous twin has lived a life of surreal misery, so she and the others have come to un-tether themselves. Fleeing to the home of friends/neighbors (Elisabeth Moss, Tim Heidecker) only causes more brutal carnage. The twists and turns continue to an ultimate “reveal,” the creepiness enhanced as the line between music and sound effects gets blurred. Fond of sinister Biblical references, Peele features a homeless man holding a sign: “Jeremiah 11:11,” referring to an Old Testament passage about a covenant between God and the people of Israel, perhaps connecting to the clones that reside in tunnels underneath Earth’s surface. On the Granger Movie Gauge of 1 to 10, “Us” is an insidious, unsettling 8. It’s nightmarish.